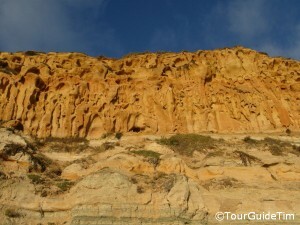 Torrey Pines State Park - TourGuideTim Reveals San Diego! The Visitors Center and the Hiking Trails are on top of the Torrey Pines Mesa, which is a little more than 300 feet above the main parking lot and beach area. It will take most visitors 20 minutes to walk up the fairly steep hill. If you are not ready for this kind of exercise, you can drive up the hill and access a small paved parking lot next to the Visitors Center. However, these spots fill up quickly during summer weekends. If someone in your car is in good shape, have them drop you off at the Visitors Center and then drive back down to the main parking lot. You will also see a dirt parking lot about three-quarters of the way up the hill with just a few parking spots. Guided Tours are available at 10AM and 2PM on Weekends, starting at the Visitors Center. Birdwatchers will appreciate this guide to birds spotted at Torrey Pines, which is prepared each month. Take all warning signs seriously. Even if you don’t see a warning sign, be very cautious around the cliffs – both at the top when you are on hiking trails and at the bottom on the beach. The cliffs are eroding and do slide down to the beach once in a great while. Stay on the marked trails and if you are on the beach, stay several feet away from the cliff. Beach – The beach does have lifeguards during the summer months. You will see a few fisherman in the early morning. Otherwise, you will see mostly families and couples. There is no playground at this location. Hiking Trail Map – There are several hiking trails at Torrey Pines. In addition to the map, the Torrey Pines Association provides a detailed description of each trail. Despite their close proximity to each other, the trails offer very different experiences. Some take you closer to the Torrey Pine trees and vegetation, a few take you to seaside cliffs offering panoramic views of both the unique landscape and Pacific Ocean, and others give you a view of impressive canyons or take you down to the beach. If you don’t have time to explore all of the trails, start with the Guy Fleming Trail. It is close to the Visitors Center and provides an easy walk through thick Torrey Pines and other vegetation, offers a view of a deep canyon and the Pacific Ocean, and during the spring is filled with beautiful wildflowers. On occasion, some hiking trails are closed after winter rains. You can check the Torrey Pines Association home page for the latest trail status report. Also, if you are inclined to take a trail down to the beach, be warned that it is very steep and you may find yourself slipping on a few occasions. It is definitely not for the faint of heart. For those who are interested in hiking along the beach from Torrey Pines to La Jolla Shores or want to hike the Torrey Pines Extension, which is on the other side of Carmel Valley Road, you can learn more about those trails and others in Jerry Schad’s book Afoot & Afield in San Diego County. Cycling – It is very popular for cyclists to ride bikes along the San Diego coast line. One of the more popular routes takes cyclists from Del Mar, which is north of the Park, past the entrance to Torrey Pines State Park and up to Torrey Pines Mesa, which is to the south of the Park. The climb up to Torrey Pines Mesa is about 400 feet in elevation. It is the long, steady ascent that attracts many riders. Cyclists can also enter Torrey Pines State Park and ride along a service road that parallels Torrey Pines Road. It will return you to Torrey Pines Road once you reach the Torrey Pines Golf Course driving range. The Park route is much steeper at the beginning and then levels off. On the return trip, you can coast downhill at about 35mph. Dolphins / Whales – Keep your eyes open while visiting Torrey Pines. Dolphins periodically swim in groups past the beach in Torrey Pines. Look for them in the area where the waves are just starting to break. Torrey Pines Road and the sidewalk along the parking area are slightly higher than the beach and provide a nice elevated vantage point to see the dolphins, and during the winter months an occasional California Blue Whale a little farther out. 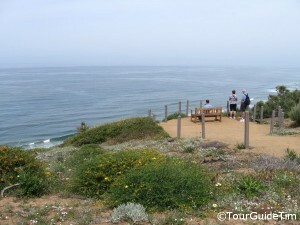 You will also be able to look for them from the hiking trails up along the Torrey Pines cliffs. Views from the Comfort of Your Car – Torrey Pines is one of the few places in California where you can enjoy the ocean views and the sound of the waves from the comfort of your car. In the ‘Parking’ section below, you will read about parking spots outside of Torrey Pines State Park. These are pull-in parking spots where you will have the waves crashing just a few feet below the front of your car. It’s a popular place for those who just want to stop by for a few minutes and relax. It is also a great opportunity for those who have a hard time getting around to enjoy the ocean. Food – There are a few restaurants along Carmel Valley Road, many with outdoor seating, that look towards Torrey Pines and the Pacific Ocean. You will find both fast-food and formal dining options. No fee if you park outside of the State Park or take a city bus. Traffic – Highway I-5 is very busy during the evening rush hour in both directions. Plan an extra 15 – 20 minutes of driving time during this period. Torrey Pines Road (Pacific Coast Highway) is also busy during this time heading northbound but with only a few minutes delay. Torrey Pines State Park is very busy on summer holidays, when the parking lot generally fills up quite early. Otherwise, you will only find small crowds when visiting this beautiful retreat. Also, as a reminder from the “What to Expect” section above, there is a small parking lot next to the visitors center for those who might have a hard time walking up the hill. For those want to save money and have enough patience, you can enjoy free parking in several dozen parking spots that line North Torrey Pines Road, just outside of the State Park entrance. You will need to be heading southbound to access these parking spots. (If you are heading northbound, you will have to make a right on Carmel Valley Road and continue to a point where you can make a legal U-Turn and return to head southbound on Torrey Pines Road.) Unless you go before 8AM in the morning, you will find most of these spots are typically filled. However, people are constantly coming and going as many visitors are just stopping by for a few minutes to enjoy the views from the comfort of their car. At most times, you should be able to get a parking spot within a couple minutes. There is an area of space between the roadway and the parking spots. Pull out of traffic and drive slowly along this space until a spot opens up. Be sure to watch out for joggers and cyclists who also use this space. There is enough room for everybody. Just keep your eyes open. Transit - North County Transit District Buses serve Torrey Pines State Park. See San Diego Transit Information for access to bus schedules and information for the online Transit Planner.